I loved the story, but I didn't care for the narrator very much. I can't add to the reams that have already been written about this novel. I adore Edith Wharton, at least-what I've read so far, and I admire her powers of observation and her wit. I wouldn't have lasted five minutes in what passed for high society in New York City in the mid 1870's. There was so much gossip, so much repressed emotion and so much...phoniness. UGH. I enjoyed this book even though I saw the movie many years ago, because as usual, the book has more depth and in this case, more scathing commentary hidden between the lines. 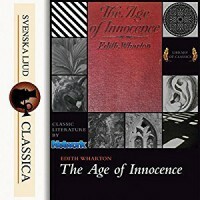 As compared to The House of Mirth, The Age of Innocence at least has a happier ending, though I guess it depends on how you look at it. Society was definitely happier, but I'm not so sure that Newland Archer or Mrs. Olenska were. Recommended for fans of Edith Wharton's work, stories of the gilded age and high society, or just plain fans of a good story.